The scooter "the alpha" and "Delta" from the Chinese manufacturer Chongqing Wonjan have virtually identical device. However, each of them designed for specific purposes, and therefore the choice of the two models should be on the basis of actual conditions in which the scooter will be operated. The scooter has a single cylinder four stroke power unit with a working volume of 72 cubic centimeters. Box on four shows running on the ring shift pattern with lock-in transition from the fourth speed to the first. A moped has a maximum capacity of 5 horsepower at the permissible speed of 75 km/h Dry weight of the moped is 81 kg. On the front and rear wheel have drum brakes and hydraulic shock absorbers. When the fuel tank 4 litres power reserve alpha without refueling is about 250 kilometers. Moped single, maximum load capacity - 120 kg. In the sales package of moped has a small coffer, which is mounted on the metal trunk. More places to placement of cargo is not available. Even with 17-inch wheels, the alpha is quite low ground clearance, which it not always copes well with bumps. For this weight the engine is quite powerful, lifting on a slope of 15-20 degrees is carried out without much difficulty. The starting mileage of running - 3 thousand kilometers. Of the main problem sites can be identified and piston system, in which after a few hundred kilometers appears extraneous noise. Also there are bugs in the electrics and the ignition system, there is no fuel sensor. By and large, the quality of the scooter can vary greatly, depending on how the were assembled. Four-stroke engine of the Delta has one cylinder, power unit is 3 HP transmission four-speed, same as alpha. The moped weighs 90 kilograms, with a smaller engine capacity gives a negative tractive power and increase petrol consumption to two litres per 100 km Brakes: drum, front telescopic fork, rear suspension moped pendulum. Ground clearance is 11 inches. Delta has reinforced mounts for placing the load on the frame, the rear seat can be removed for use of the trunk. Increased fuel consumption, partially compensated by a bulk tank of 4.5 liters. The load capacity of the scooter is 100 kg, has two seats. Because of the small power motor Delta worse cope with the load, although the speed characteristics on a level road it does not suffer. The wheels of the moped have a diameter of 17 inches, but the engine is quite high, which increases the permeability of the moped. Since the device of the engine and transmission have scooter identical to, the problems they have are the same. In the wiring diagram are also present vulnerabilities. 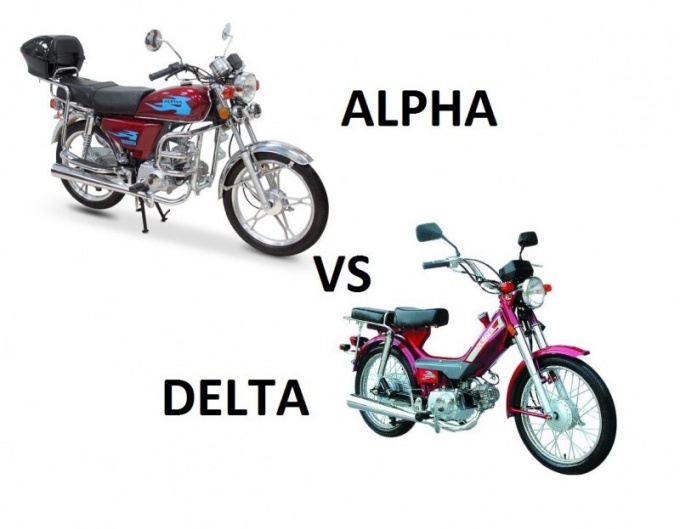 Mopeds alpha and Delta are available with different amount of the power unit, so the lack of power can be compensated. The design of the main nodes have the same scooter, same can be said about the basis of spare parts. The choice should be made taking into account the purpose of exploitation. For movement in the urban cycle is perfect alpha, he is more dynamic when riding and are not designed to travel on the road. Delta is suitable for use in the economic purposes. It is possible to accommodate a large number of discarded goods, and the high waist will easily move around the potholes on the dirt road.